If standing over a pot of oatmeal on the stovetop every morning doesn’t quite appeal to you, overnight oats may be your best bet. In addition to its low cost, nutty flavor, and versatility, oatmeal is also at (or near) the top of the “healthiest foods” lists compiled by medical experts worldwide. Oatmeal has been a popular choice for a healthy breakfast in America for over 150 years, but our busy schedules these days often prevent us from preparing it in the traditional way. Food manufacturers addressed the issue in the 1960s by introducing instant oatmeal, which cut the cooking time to one minute. 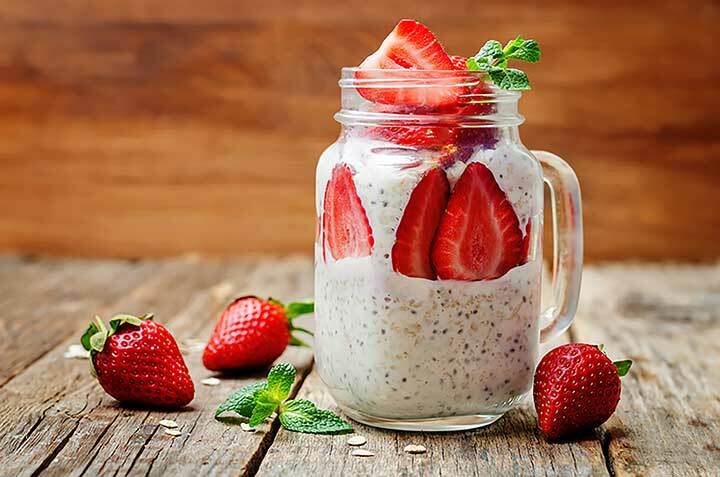 Because many varieties of instant oatmeal contain added sugar and artificial ingredients, however, nutrition experts are suggesting the switch to overnight oats. So what are overnight oats, and why should we be eating them? Oatmeal is made of whole oat grains that are dehusked and then rolled, milled, or steel-cut. It is traditionally boiled in salted water and/or milk to make a breakfast porridge, or used to make cookies, bread, cakes, cereal, muesli, and granola. Oatmeal, which has long held a place in Scottish and Irish cuisine, didn’t gain popularity in America until the 1850s, according to MentalFloss.com, when the German Mills American Oatmeal Factory was opened by Henry Parsons Crowell in Ohio. One of German Mills’ main competitors back then was Quaker, a brand that has since become synonymous with oatmeal in America. In addition to its low cost, nutty flavor, and versatility, oatmeal is also at (or near) the top of the “healthiest foods” lists compiled by medical experts worldwide. Oats are a good source of protein, fiber, antioxidants, and plant sterols, which can regulate your cholesterol, aid in digestion, help keep you fuller longer, and lower your blood pressure. One cup of plain oatmeal (cooked with water), according to LiveStrong.com, contains 166 calories, 6 grams of protein, 4 grams of fat, 28 grams of carbohydrates, and 4 grams of fiber. It also contains 15 to 18 percent of your daily value of selenium, phosphorus, and zinc, as well as 10 percent of your daily value of iron. Now, let’s find out what the buzz is about overnight oats. #1. They’re easier to prepare than cooked oats. While oatmeal normally involves stovetop or microwave cooking for a few minutes—depending on the variety you choose—making overnight oats is pretty simple. You just soak them in the liquid of your choice, store them in a container with a tight lid in the fridge overnight, and then add your favorite toppings in the morning…easy peasy. #2. Overnight oats retain more of their nutrients. According to LiveStrong.com, soaking your oats helps decrease the amount of phytic acid, which can prevent your body from absorbing nutrients. Cooking oats can break phytic acid down as well, but research suggests that soaking does a better job. #4. Overnight oats contain more protein and fiber. One cup of cooked oatmeal, according to LiveStrong.com, contains about 6 grams of protein and four grams of fiber, while a cup of uncooked oats contains 11 grams of protein, and 8 grams of fiber. But keep in mind that uncooked oats also contains additional calories, fat, and carbohydrates. Use a 2:1 ratio of liquid to oats so that the results are creamy, but not too chewy or soupy. The old-fashioned variety of oatmeal is best when making overnight oats. Steel-cut oats will provide a chewier texture, while instant oats will dissolve in the liquid. Wait until the morning to add your toppings to prevent them from getting mushy— unless your using dried fruit or chia seeds, which can benefit from soaking in liquid overnight. Add a pinch of salt to make your overnight oats taste even better. Give your oats one final stir before eating. Milk and/or yogurt can provide a creamier texture, but if you’re following a dairy-free diet, try almond milk. Add spices like cinnamon, ginger, and/or vanilla for extra flavor and health benefits. Eat your overnight oats within 24 hours to prevent them from getting too soggy. 1. Add milk or fruit juice, yogurt, and pureed fruit to oatmeal cup and mix well. 2. Replace lid and chill overnight before enjoying. 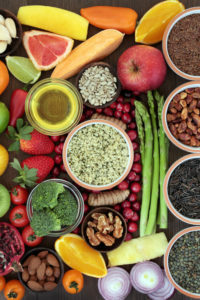 add, antioxidants, bad cholesterol, bad cholesterol levels, blood pressure, breakfast, calories, cholesterol, cholesterol levels, cooking, dairy, dairy free diet, diet, digestion, fiber, food, foods that lower cholesterol, ginger, gluten, gluten free, health, healthy breakfast, heart health, heart healthy, iron, is oatmeal gluten free, lower cholesterol, lower your blood pressure, milk, nutrients, nutrition, omega 3, plant sterols, protein, recipe, selenium, spices, sugar, to lower cholesterol, vitamin, vitamin c, yogurt, zinc. Overnight oats do NOT “contain more protein and fiber”. The article cited for this claim makes it clear that their comparison was between cooked oats and DRY oats – not between cooked oats and soaked oats – and that the difference is just due to the fact that “oats expand as they’re cooked in liquid”. Please fix this. We love our oatmeal. We will certainly try this method. I cannot eat oatmeal, it tears up my gut, even steelcut does, am Celiac Sprue from birth. Do you eat overnight oats cold or can you heat them up without losing any benefits? I sure hope that we don’t have to eat them cold. I am really disappointed to find a direct contradiction on one page of your website. Within column inches it is stated that overnight soaked oats have the same calories as those cooked and below that statement the exact opposite is stated. We are all beset with so much ‘information’ from ‘experts’ about nutrition and health matters, it does nothing to inspire confidence to find such a blatant contradiction in relation to quite a simple matter of calorie content. Hello Paulyn, thank you for your comment. We apologize for the error and the article has been edited.